The world-leading fleet of marine robots operated by the National Oceanography Centre (NOC) has just had its busiest two months ever. The robotic vehicles have been operating in some of the world’s most hostile waters, from the Arctic to the Antarctic, and from the coast to the deep ocean. 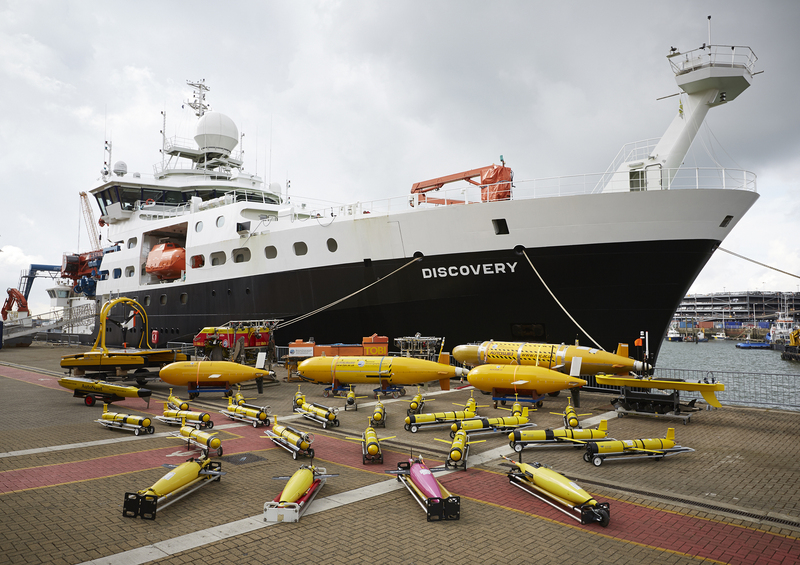 Over 15 submarine gliders, wave gliders and autonomous underwater vehicles (AUVs) were in action during January and February, spread across an area of ocean that extends for more than 15,000 km from the Barents Sea in the Arctic to the Weddell Sea in the Antarctic. The robots are supporting a number of major science projects, primarily funded by the Natural Environment Research Council (NERC) and the European Research Council (ERC), involving scientists from several universities and research centres across the UK. They are supporting research projects that include: study of climate-change and human impacts on marine ecosystems, measuring heat and carbon flux in the ocean, and studies of large-scale ocean circulation and physical processes. The MARS facility is benefitting from significant capital investment as part of the Industrial Strategy Challenge Fund. As well as ensuring that UK scientists continue to have access to cutting-edge technologies to support their world-class research, the MARS fleet also underpins a number of joint projects with industry, defence and policy partners to deliver wider UK socio-economic benefit. Find out where our vehicles are and what they are doing by viewing the MARS tracker. The NOC operates the National Marine Equipment Pool (NMEP) which is the largest centralised marine scientific equipment pool in Europe with a diverse range of scientific instruments and equipment capable of sampling from the sea surface to the deep ocean. Suitable for studying a range of scientific disciplines, the NMEP holds more than 10,000 instruments and technologies, and provides scientists with access to skilled marine technicians and engineers. As part of our national capability remit, the NMEP delivers professional technological support to enable the marine science community to carry out world-class research around the globe.